Note: This post was co-written with Geraldine Cahill, communications manager for Social Innovation Generation (SiG) National. When you think of Hamilton, Ontario, what comes to mind? The Hammer? Steel Town? Smokestacks? When we visited Hamilton in February, we saw a beautiful city nestled between the soaring Niagara Escarpment to the south and Lake Ontario to the north, surging life science and health academia and businesses, and a downtown core poised for growth and change. The most striking thing of all was the conviction and passion of our hosts about Hamilton and the potential of its people. The Hamilton Chamber of Commerce believes it might be time to unleash this potential by adding a citizen-led social innovation lab to the city’s arsenal. Let that sink in for a moment. At MaRS Solutions Lab and Social Innovation Generation, we regularly receive requests from governments and community organizations for advice on setting up social innovation labs, but this is the first time we’ve had such a request from business owners. In 2012-2013, Geraldine Cahill and her colleagues undertook field research about Hamilton’s social and economic challenges as part of the Waterloo Institute for Social Innovation and Resilience Graduate Diploma in Social Innovation. 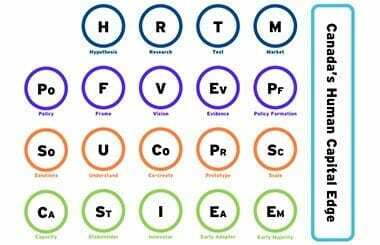 When the results of the study were presented, the Hamilton Chamber of Commerce was sufficiently convinced of the value of a social innovation lab that it wanted to explore the idea further with a broader group of Hamiltonians. Thanks to Keanin Loomis, president and CEO of the Hamilton Chamber of Commerce, and Doug Ward and Paul Lakin, members of the chamber’s Science, Technology and Innovation Sub-Committee, we found ourselves introducing social innovation labs to a room full of business owners, academics, community leaders, political leaders and civil servants at McMaster Innovation Park. Like many contemporary peer cities, Hamilton is grappling with tensions and uncertainties. In October 2013, the Toronto Star ran an article on Hamilton’s economic and social rise, quoting its mayor Bob Bratina as saying: “We’re now at the tipping point of a new city—one we all knew could exist.” Within the same article a young McMaster student was quoted saying that she feels the political leaders in Hamilton are distant and need to be more in touch with the public. This sentiment was heard repeatedly during the field research on Hamilton. In December 2013, the unemployment rate in Hamilton stood at 5.9%. This is a very strong number compared to unemployment rates in other Canadian cities of a similar size. Yet few newcomers to Hamilton are settling in the city permanently. The thousands of graduates from the city’s university and colleges don’t stay. What kind of a Hamilton do newcomers and graduates want? According to Statistics Canada data from 2011-2012, 60.4% of Hamiltonians are overweight or obese, a figure that is significantly higher than Ontario’s 52.6% and Canada’s 52.3%. McMaster University researchers and McMaster Children’s Hospital clinicians have joined forces to tackle childhood obesity, combining expertise in genetics, metabolism, biochemistry, physical activity and other areas to develop new ways to prevent and treat obesity-related diseases. But will this be enough? All of these issues are highly complex and seemingly intractable. There are no easy solutions that experts, stakeholders and citizens can all agree on. These are problems that we can only solve through trial and error. However, this necessary experimental approach seems impossible for government with its current structures, especially in an economic climate of decreased public resources and increased scrutiny. But the capacity for society—businesses, non-profit organizations, entrepreneurs and individual citizens—to solve problems is at an all-time high. People are better educated and have access to more technology and information than ever before. Private capital for social good is more available than it has ever been. Social innovation labs (#PSILabs) like MaRS Solutions Lab capitalize on this emerging problem-solving capacity to meet complex social and economic challenges with society. Hamilton has a long history of experimentation, adapting and thriving against overwhelming odds. In fact, rising from the massive losses in its steel industry, Hamilton is the most diversified economy in all of Canada. Hamilton Health Sciences is now Hamilton’s single largest employer, while corporate construction projects have topped Canadian cities two years in a row. At our presentation, the passion and readiness of the Hamiltonians in the room was apparent. There was a flurry of questions, from how quickly we could get started and how much it would cost to what the team would need to look like. Discussions about what was possible had already begun. We felt the rare willingness to collaborate across organizations and sectors. There was tangible excitement about even our most audacious suggestion of a challenge: to transform Hamilton into a city of innovators and entrepreneurs in life sciences, advanced manufacturing, arts, logistics and agri-food—essentially to become Canada’s cutting-edge human capital hub. After the presentation, Keanin Loomis took us on a tour of Hamilton. From the top of Stelco Tower, the panorama of Hamilton was breathtaking. 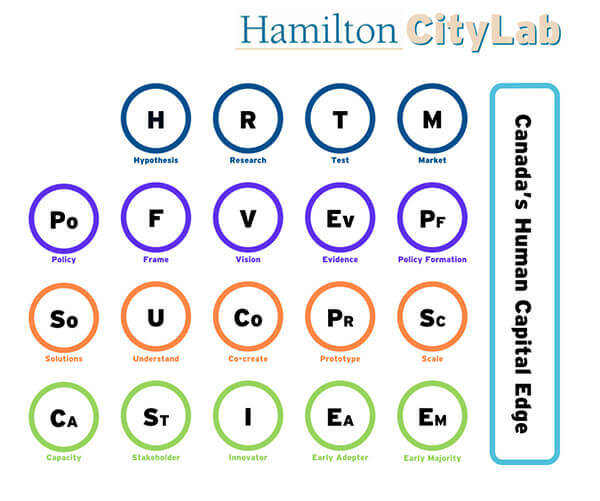 We believe that a social innovation lab will help drive and capitalize Hamilton’s ambitions. Is a social innovation lab right for your city? You can view our presentation on building a Hamilton CityLab here. Stay up to date on news and events from MaRS. Sign up to tailor your own innovation ecosystem newsletter.